In love—and in restaurants—timing is everything. 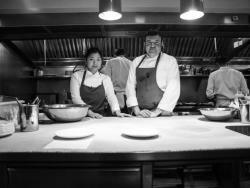 For instance, when Kelly Jeun was cooking for chef Mark Ladner at New York City’s acclaimed Del Posto restaurant after culinary school, she didn’t enjoy working with Ladner’s new sous chef, Eduardo Valle Lobo, one bit. “She hated me,” Valle Lobo says. “I was so arrogant!” recalls Jeun. “I thought Eduardo was just the new meat cook; I was a hotshot, but in reality, I had a lot to learn. And then, one night, I borrowed Eduardo’s knife…and it was so sharp and beautifully honed that I couldn’t help but begin to respect him. I realized that maybe I could learn something from him.” Over time, that respect evolved into deeper feelings; the couple have worked and lived well together since 2011.